In comparison, a shared car with 50 percent usage has 10 times better utilization and needs parking only half the time. But, that doesn't mean that the ideal carsharing city will need half the parking spaces. Surprisingly, carsharing would reduce the number of parking spaces a city needs by more than 10 times. Rush hours mean that most people want to use cars during peak times. Let's suppose that all people need cars in a three hour peak and that the average non-rush commute lasts for 30 minutes (I will explain later why I'm using a non-rush commute). Then we can only have 6x fewer shared cars to replace private cars, not 10x. When your car breaks, you don't need a replacement car. Every carshare you see is your "replacement" car. Not everything about carsharing is perfect. Sometimes the shared car I got wasn't quite clean—somebody had transported a dog on a passenger seat. But, when I think about it, I didn't clean my previous private car for months and sometimes it looked like I was transporting pigs with diarrhea, so maybe I shouldn't complain. While Sixt is partnering with BMW, Hertz has its own Hertz On Demand, although it is obvious from its website that Hertz is still in rent-a-car mindset and doesn't understand how the new thing works. Other carsharing companies have "socially automated" refueling. For example, in car2go you don't ever have to refuel, but they give you 10 free minutes if you fill up a car with less than a quarter of a tank of gas. Total carsharing can eliminate the traffic jams of rush hour—but that doesn't mean you won't have to wait. There is less chance of some route "jamming" and reducing car throughput. "Shared" carsharing. Imagine that you open a carsharing app of the future and request a car. The app puts you in a waiting queue and says that the estimated waiting time for the next car is 30 minutes. But someone from the same street is going to the same part of town. The app offers to cut your waiting time to 15 minutes if you both share the same car. Since you don't know the person, the app offers to increase security by enabling a video camera inside the car (it is there anyway, to check whether you left the car clean). You accept the pooled ride, but decline the camera option, as the other person's profile is rated 4.5 stars. Your car is available in 15 minutes. "Premium" shared cars. Let's say you are in a hurry and don't want to use a carsharing company that tries to maximize car usage. You use a more expensive carsharing company that promises to have a car available in five minutes or the cost of ride is on them. You pay a premium to get somewhere faster. It's a nice system, although I guess in some posh downtowns everybody will try to use the premium shared cars, in which case you are back to square one. Then you need a "super-premium" car share. Another option is existing car sharing companies adding surge pricing, but Uber showed that paying 4x more for basically the same service didn't go well with the customers. If all that space becomes available, cities can reclaim it for public use. This is especially true in Europe, where cities were never designed for cars—to make room for them, something had to be given away. Year by year, streets have been made narrower by side parking, parks have been converted to parking, and new buildings have been constructed with large parking lots next to them. If the majority of the transportation burden falls to shared cars, buildings will just need a "valet" parking area in the front. The valet will not be a real person—but your smartphone. 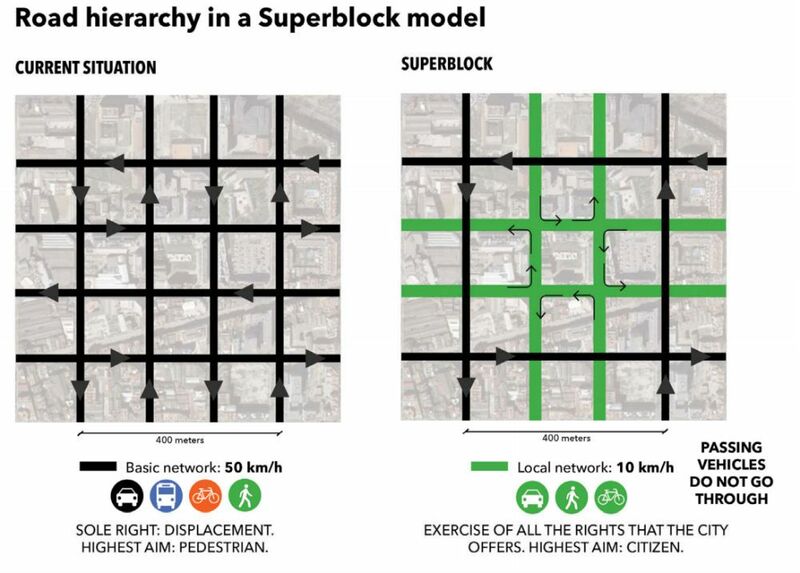 All that transformation would be powered by the simple idea: The purpose of cars is to be driven, not parked. In 2014, Sergey Brin said this of Google's self-driving car: "So with self-driving cars, you don't really need much in the way of parking, because you don't need one car per person. They just come and get you when you need them." In 2016, Elon Musk unveiled his master plan, which states: "You will also be able to add your car to the Tesla shared fleet just by tapping a button on the Tesla phone app and have it generate income for you while you're at work or on vacation." In 2015, even GM said: "We've come to the conclusion that our industry within the context of today's traditional vehicles and today's traditional business model is not sustainable in its current form." The private car is not a fair competitor. Parking is subsidized by both the politicians and the average people. People want "free" parking, but do you really think that 16.8 m2 of valuable land in the city is "free"? It is not just taxpayers' money. When you go to a McDonald's, a parking fee is hidden in the burger price because the owner needed to purchase land for a parking lot. When you purchase a condo, the price is higher because the building developer needed to build underground parking. The book The High Cost of Free Parking estimates that the total cost of "free" parking in the U.S. is 1-4% of the GNP. (I also highly recommend that you listen to the Parking is Hell episode of the Freakonomics podcast.) The economic price of monthly parking in big cities goes from $438 in Boston, to $719 in Rome, to a staggering $1084 in London. However, carsharing is already everywhere. There are rideshares like Uber and Lyft. You can convert your existing private car to a shared car with an electronics kit, such as the $99 Getaround Connect. With new legislation in the cities, which promotes the sharing of cars and doesn't subsidize parking, we can have more liveable cities and better urban transport now, without large capital investments.